Our most popular piston & cylinder set is the 86 mm bore with 9.25 c.r. 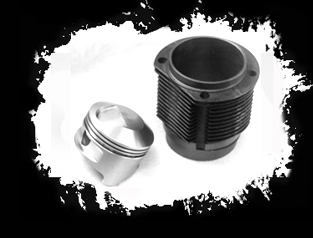 These are designed for the C/SC/912 cylinder head, which has a 30° combustion chamber angle. We also have a 83 mm bore X 9.5 c.r. which is made for the 356 A & B heads with a 22° chamber angle. The pistons and cylinder sets sell for $1495.00 per set, either size. If you have cylinders, however, you may purchase the pistons, rings, etc, for $950.00, and have your cylinders bored to size, thus saving at least $200.00 to $250.00. A four page instruction manual comes with each set. Rings generally break in within 300 to 500 miles. Many customers report never adding oil between changes - 3,000 miles per quart is common! This is unheard of with stock pistons and cylinders. Our products are quiet, powerful, light weight and, best of all, reliable. I believe they are the finest pistons and cylinders on the market today! For pre-"A", 2 piece case engines, 80 mm X 8.5 c.r. piston and cylinder set. Race pistons: 83.5 or 86 mm X 11.5 or 10.5 c.r. pistons & cylinder set. "Big Big Bore" - 90 mm X 10.50 c.r. piston & cylinder set. Custom sizes in both piston bore and cylinders can be made available. To order, please use phone or fax only. Do not email through this website as it is for information only. We take VISA and Mastercard only, for prices and availability please contact us.